These soft vibes are 110mm in length and weigh 26 grams. 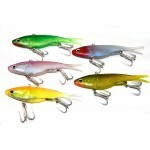 They come in five colours and have VCM X-Strong Treble Hooks. They have caught Barramundi, Mangrove Jacks, Grunter, Fingermark Bream, Black Jews as well as Cod, Yellow Belly, Flathead and Jew Fish. Trade enquiries welcome. These vibes are 110mm in length, weigh 26grams, have VCM X-Strong Treble Hooks and come in five d..